What's the maximum amount of current which I can draw from each of the Arduino's pins without tripping any of the internal fuses? Is there a limit per pin as well as an overall limit for the whole board? However, depending on how you define the Arduino "Pins", this is not the entire story. The 5V pin of the arduino is not connected through the microcontroller. As such, it can source significantly more power. When you are powering your arduino from USB, the USB interface limits your total power consumption to 500 mA. This is shared with the devices on the arduino board, so the available power will be somewhat less. When you are using an external power supply, through the barrel power connector, you are limited by the local 5V regulator, which is rated for a maximum of 1 Amp. However, this it also thermally limited, meaning that as you draw power, the regulator will heat up. When it overheats, it will shut down temporarily. The 3.3V regulated output is able to supply 150 mA max, which is the limit of the 3.3V regulator. The 3.3V output is capable of supplying 150 mA. Note - Any power drawn from the 3.3V rail has to go through the 5V rail. Therefore, if you have a 100 mA device on the 3.3V output, you need to also count it against the 5V total current. Note: This does not apply to the Arduino Due, and there are likely some differences for the Arduino Mega. It is likely generally true for any Arduino based off the ATmega328 microcontroller. These seem to be more or less standard for most Arduinos, as these current limitations are for the microcontroller. What's the maximum amount of current which I can draw from each of the Arduino's pins without tripping any of the internal fuses? If you draw too much current (40mA or more) from an I/O pin, it will damage the pin. There are no fuses on the I/O pins. According to the v2.3 schematic, the Arduino Nano 3.3v regulator is the FTDI usb to serial ic. That has a max current rating of 50mA. If you take a look at the schematics for the Nano you can see that the 3.3V pin is provided by the FT232RL chip. 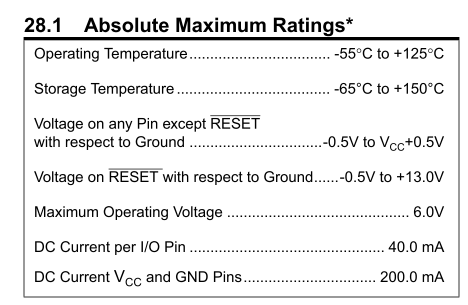 According to its datasheet that pin can provide a maximum of 50mA. Not the answer you're looking for? Browse other questions tagged arduino safety power or ask your own question. What are the most common ways to fry an arduino? Sinking 80 mA with a microcontroller without any driver circuit? How to chose a diode for breadboarding? How should I light up all the LEDs? Can I use two Arduino digital pins in parallel to keep a higher voltage? How do I increase the drive current from the arduino digital pins?